Everyone knows about non-profit or tax exempt organizations. In fact, you have probably participated in, donated to, or volunteered for one. Non-profits, regardless of their mission, seem to have the same long term goal: to better the world. And did you know that sponsoring a non-profit can expand your own target audience? If not, read on. So, why should your business care about non-profits? For one, non-profits, or 501(c)(3)s are eligible for a Google Advertising Grant valued at up to $120,000 per year – and if you choose to sponsor one, your business can be branded right along with that non-profit on Google. Yes, Google. Google is the number one website on the globe, and your company can market itself there when it sponsors a non-profit organization. Another reason your business should care about sponsoring a non-profit is because non-profits are helping humanity. Many are involved with feeding the hungry, housing the homeless, and fighting human trafficking. And a benefit from helping one of these awesome causes? Consumers will associate your business with one that cares about bettering the world. Your business will start to garner attention as one that stands out from the rest! 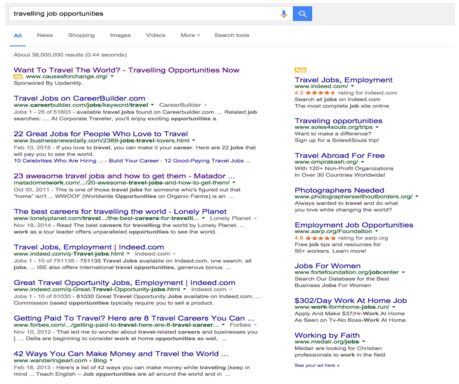 What Does A Sponsored Ad On Google Look Like? You can see that Causes For Change, a non-profit, is advertising about travelling opportunities with its organization. Causes For Change take medical mission trips to underdeveloped countries and assist the poor and sick. 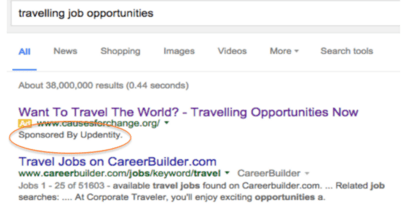 In the red circle, you can see that the sponsor of Causes For Change, Updentity, is promoted right on Google, on the very first page of the search results. Finally, here is an opportunity for a 501(c)(3) to get some well-deserved recognition, as well as your business! The Better Communication Forum has partnered with marketing agency, Updentity. Updentity helped us get our Google Grant, and we are now advertising on Google with them as our sponsor! Because of this, we are getting more website and social media visitors than we ever have before. Updentity is currently accepting businesses who are interested in this unique advertising opportunity. They are collecting a list of businesses, and then matching those businesses to non-profits who seem like a good match. For example, they recently matched a domestic abuse organization to a law firm who manages domestic violence cases. If your business already has a non-profit in mind who it would like to sponsor, let Updentity know. Both your business and the non-profit will benefit greatly from advertising on the most recognized website in the world! To get on the wait-list or find out more about sponsoring a non-profit and advertising on Google, contact idGrants today by visiting www.idGrants.com.